Built around a calendar core, Leo delivers a personalized schedule to each user – so students only see their own small group events, lab sessions and lectures, not every event in every course. Likewise, faculty can filter the calendar to see only the events where they are instructors. Students can also quickly see whether events are mandatory, the location and materials, even whether there’s a particular dress code — all from a single screen. Leo also offers iCal feeds, so users get real-time updates to calendars on their personal devices, keeping them informed and on top of everything they need to do. Other tools may talk about curriculum mapping, but they only map to your assessments or your content. What about the rest of your curriculum? 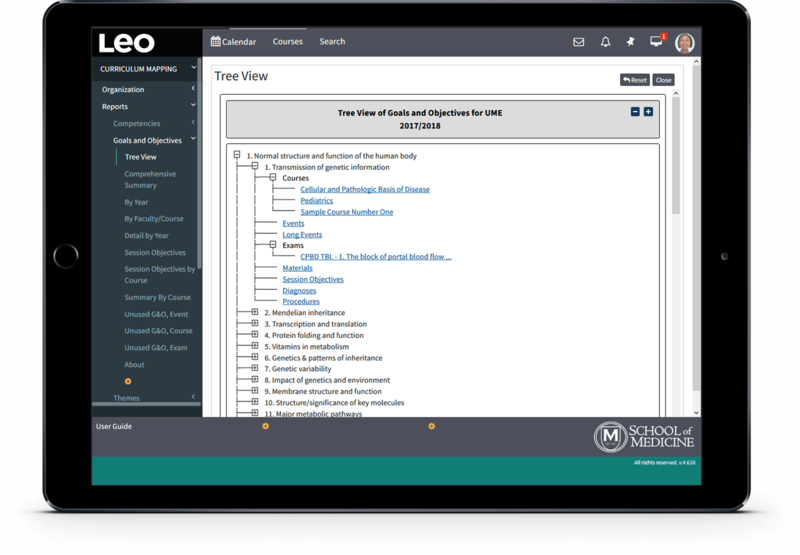 Only Leo lets you map every session in every course — didactic or clinical. 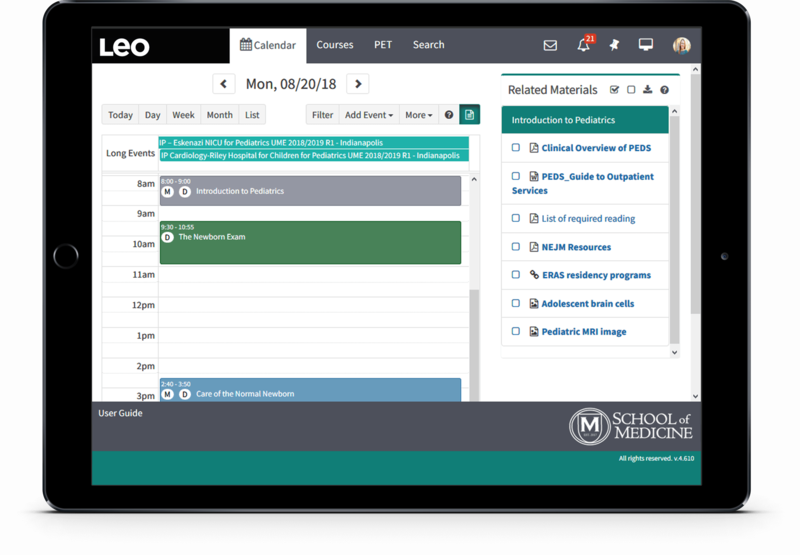 With Leo, you can also map themes across courses, as well as diagnoses and procedures for patient encounter logs. And the mapping function in Leo makes it easy for faculty to prove how their teaching supports your program objectives. 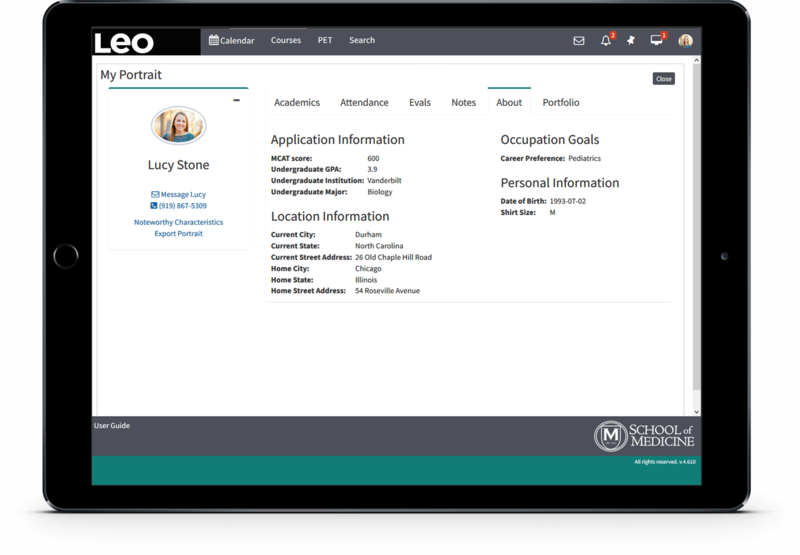 Only Leo can show you the Academic Portrait®, a comprehensive, longitudinal view of student performance including courses, grades, attendance, evaluations, notes, portfolios, custom demographics and more. Faculty advisors, students and administrators can upload, organize and export documents and materials related to the student’s performance. The Academic Portrait also greatly facilitates the authoring of MSPEs. 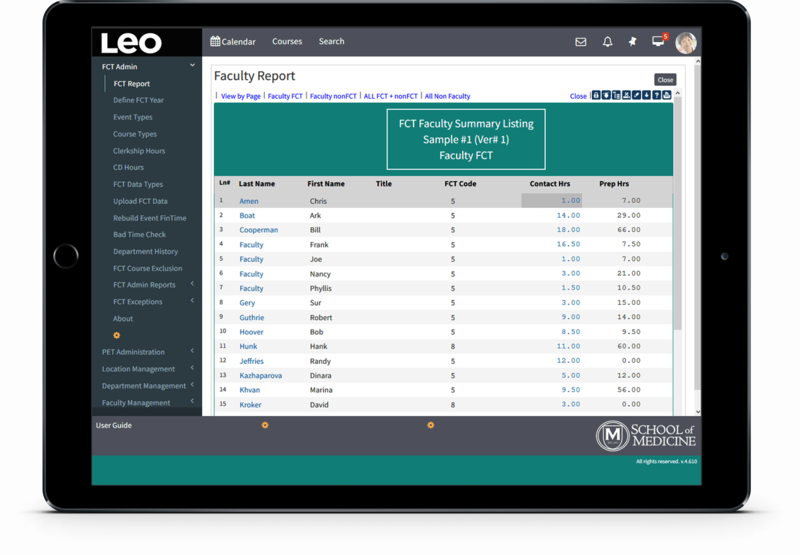 Leo knows how to measure and calculate faculty contribution based on class time, prep time and other parameters to generate a report that can be run in real-time, at any time. Faculty can be assigned different roles and disciplines on a per-session basis. FCT reports from Leo can show totals by course, event type, academic year, department, division, individual, role, discipline and other categories to help you understand the actual cost of delivering your curriculum.